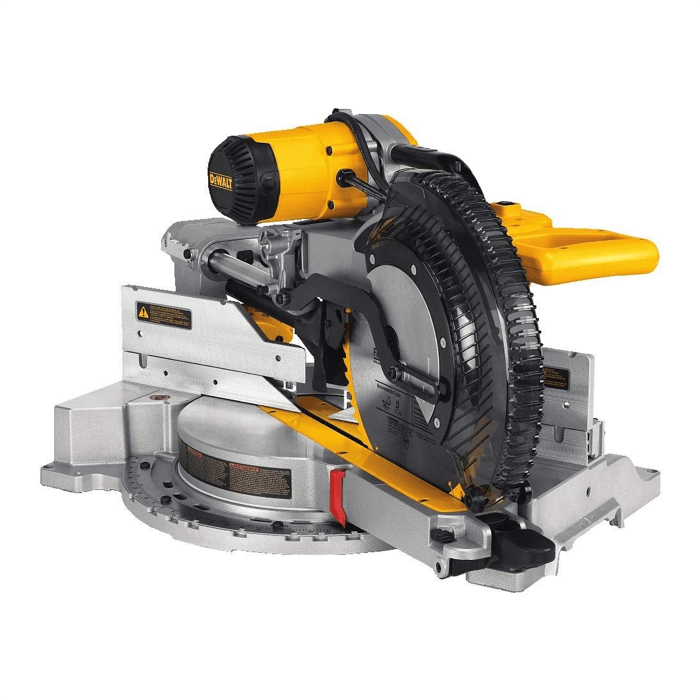 Model Number: DWS779 Arbor Size: 5/8" or 1"
Cutting Diameter: 12" Tool Dimensions (L, W, H): 32.77" x 19.05" x 20"
The DEWALT DWS779 12″ Sliding Compound Miter Saw is the ideal option for anyone looking for portability without compromising on the power and cutting capacity needed to handle even the toughest tasks. 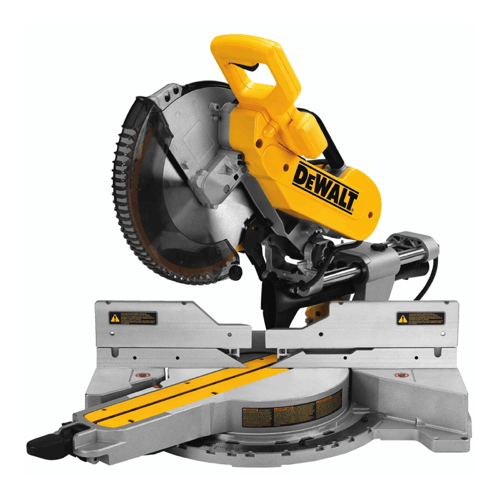 The DWS779 packs more than enough punch for even the toughest of cuts thanks to its powerful motor and 12-inch cutting blade, while it’s double-bevel design capable of bevelling left and right, as well as mitering both left and right, will have you performing even the most complex of cuts with ease. The DEWALT DWS779 is one of the most simple yet effective and well-made compound miter saws on the market, and it’s ideally suited to anyone from beginner hobbyists to professional tradespeople as a result. The primary source of the DEWALT DWS779’s superior cutting capabilities is its powerful 15-amp, 3800 RPM motor, and this helps the miter saw cut through even the toughest of woods. The cutting blade itself also plays a crucial part, and this is a 12-inch carbide blade in the case of the DWS779 to help it achieve a crosscut capacity of 2in. x 14in. dimensional lumber at 90° and 2 in. x 10 in. dimensional lumber at 45°. Carbide is becoming an increasingly popular choice thanks to its ability to provide more precise cuts versus steel blades, and it benefits from better long-term durability meaning you’ll save money from not needing to replace blades as often. The addition of carbide also helps it to cut through more robust materials that would usually destroy conventional cutting blades, giving you the peace of mind that the DWS779 will be able to handle whatever approved materials and lumber sizes that you can throw at it. 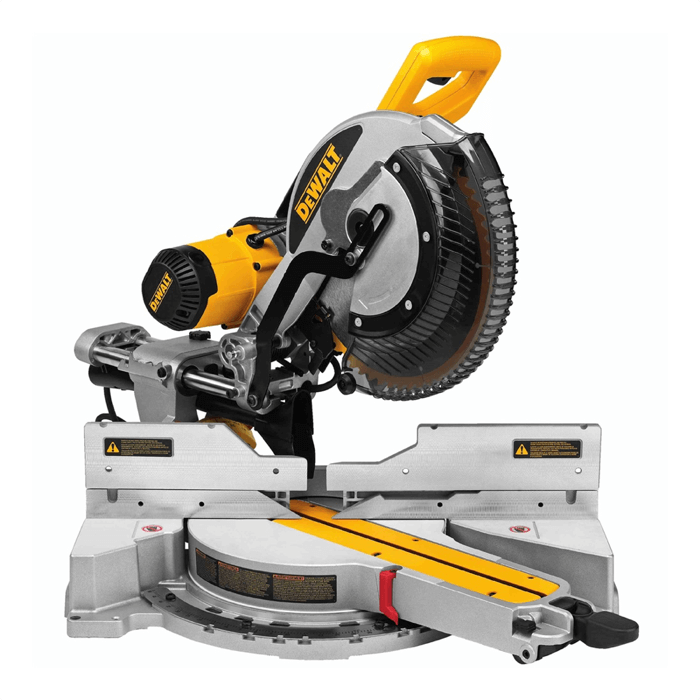 The miter saw’s motor and blade sit on dual horizontal steel rails, which feature DEWALT’s innovative clamping mechanism and linear ball bearings which not only help to improve the accuracy of each cut but also keep the DWS779 as compact and durable as possible. 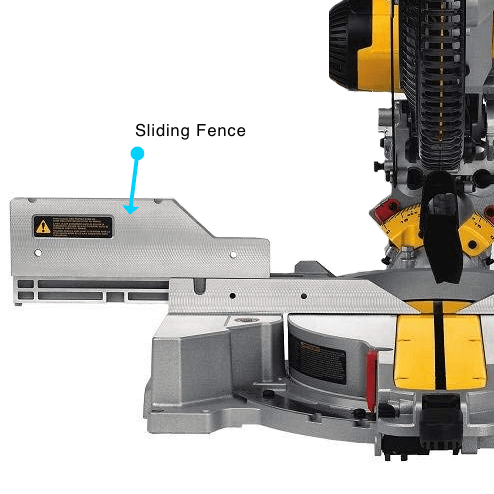 The DWS779’s fencing system also plays a vital part in improving the accuracy of each cut. The fence itself is adjustable, allowing you to extend it to provide support for longer pieces of timber, while it’s high enough (and the blade provides enough clearance), to enable you to support 6-3/4 in wide timber in a vertical orientation while cutting. Power is just one aspect of a useful electric saw, however. Just as necessary is the flexibility to accurately handle a variety of complex cuts, and the DWS779 makes this possible thanks to the fact that you can adjust the blade’s orientation in a few different ways. Firstly, it features a double-bevel capability that allows you to bevel the blade both left and right, with positive stops located 0°, 22.5°, 33.9°, 45°, and 49° in both directions. It also features a handy oversized bevel gauge, which when combined with the positive stop angles, helps you to quickly and accurately adjust the saw’s angle in preparation for your next cut without any second-guessing. Mitering is another option that couldn’t be easier with the DEWALT DWS779, too. The saw features a simple but highly effective cam-lock miter handle that can be used to change the miter angle quickly up to a maximum of 50° left and 60° right. As with the bevel gauge, the miter system features positive stops (10 in total) built into a sturdy stainless steel detent plate, and this features all of the most common miter angles to help you spend less time preparing and more time cutting. The ability to handle precision cutting also helps the miter saw stand out against other tools which at first glance look quite similar, for example, table saws. While you can perform complex cuts using a table saw (for example the Bosch GTS1031 or DEWALT DWE7480 which we have also covered), there’s no denying that miter saws like this one are a far better choice when working with smaller timber profiles that require intricate and precise angles. While safety should be a high priority with any power tool, it is arguably of even greater importance with a miter saw given the speed of the blade. To help improve user safety, the DWS779 comes with a blade guard to act as a physical barrier between the user and the cutting surface whenever the blade is in the upright position, and as an additional safety measure, it features an automatic electric brake which stops the saw’s blade within 5-seconds of trigger release. The DWS779 also comes equipped with a dust bag featuring a handy zipper for easy emptying, which DEWALT claims to be efficient enough to capture over 75% of the dust generated. We don’t know about you, but any feature that helps minimize the hassle of maintaining a clean worksite/workshop is hugely appreciated! Finally, the DEWALT DWS779 is highly portable given the fact that it weighs only 56 lbs and it features a handy carry handle and a foldable design to make it as compact as possible while not in use. As a result, the professional woodworker will have little difficulty transporting the miter saw between jobs, while the amateur hobbyist will be able to store it or leave it place following use without it being a hassle or inconvenience. Many of the saw’s crucial components are made from metal too to improve durability, helping protect the DWS779 from bumps, scrapes, and knocks during use, transportation, or while in storage. 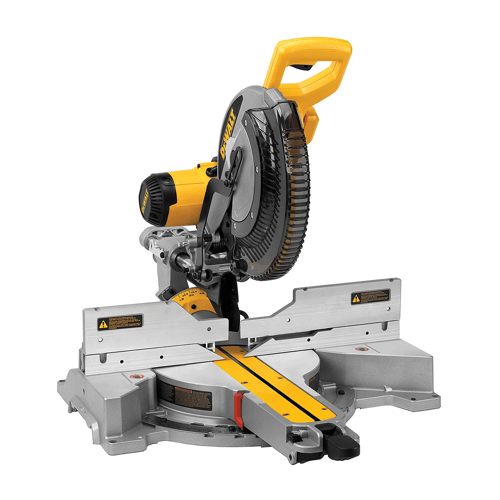 The DEWALT DWS779 12″ sliding compound miter saw provides a great mix between ease of use, power, and value for money. It’s simple enough and features excellent safety features meaning that beginners shouldn’t be intimidated or put-off, yet powerful enough and packed with enough impressive features to make it a serious contender as the go-to power tool for the professional tradesperson. 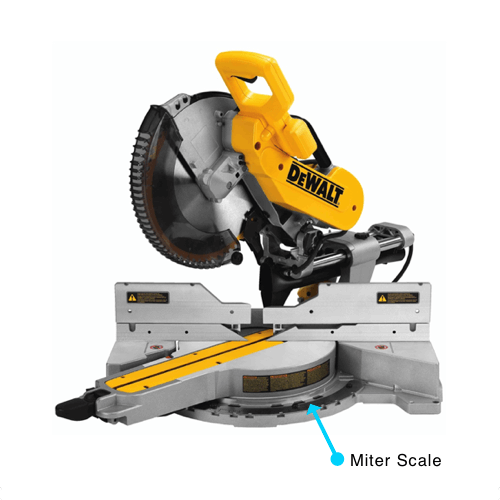 Throw in DEWALT’s stellar reputation for designing and manufacturing quality, affordable power tools, and you certainly can’t go wrong with the DWS779 miter saw. Cut through even the toughest of woods thanks to the DEWALT DWS779’s powerful cutting abilities (it features a very capable 15 Amp, 3800 RPM motor and carbide blade). Perform complex cuts with ease given the saw’s double-bevel capability (between 0° and 49° left and right), and its ability to miter both left (50°) and right (60°). Spend more time cutting and less time preparing for each cut with the DWS779’s many positive bevel and miter stops. 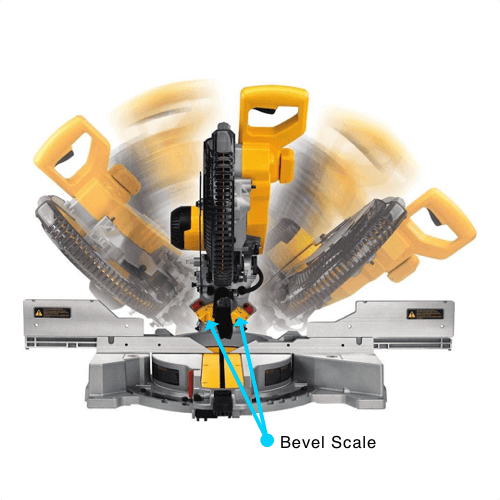 Minimize mess and the hassle of cleaning with the miter saw’s efficient dust collection system which DEWALT claims can capture over 75% of dust generated. Stay safe thanks to the DWS779’s built-in blade guard and electric brake. Don’t worry about the miter saw’s ability to stand up to even the toughest of site conditions given its durable build where the majority of crucial components are metal. Transport the DEWALT DWS779 with ease thanks to its lightweight, foldable design and its handy carrying handle. The DWS779 does not feature DEWALT’s advanced cut alignment system (called the CUTLINE Blade Positioning System), which uses an ultra-bright LED to cast a laser-like shadow on the cutting surface for more accurate cutting (the DEWALT DWS780 does offer this, however, but it is considerably more expensive). Arbor Size: 5/8" or 1" 5/8" or 1"
Dimensions (L, W, H): 32.77" x 19.05" x 20" 32.77" x 19.05" x 20"